Do you have any purple kitchen appliances and accessories? There are so many shades and hues of purple that sometimes it is hard to find just what you are looking for. 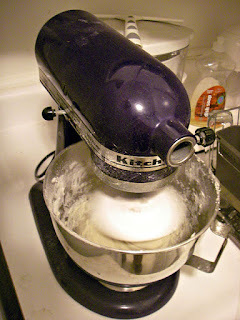 For instance, the color of this KitchenAid stand mixer is plumberry. The lighting makes it darker than it actually is. Too much purple has been shown to cause moodiness in some people, so it is a color best used for accent in a room, such as using purple kitchen appliances and accessories to embellish white kitchens, rather than having a solid purple room. You might even consider just using a small splash of purple in the kitchen, such as a purple kitchen gadget. If you want a purple kitchen, colors you might search for are purple, metallic purple, elderberry, mauve, eggplant, dark lavender, plum, boysenberry, or plumberry. As with many other kitchen colors, you have to be careful if you want everything to match perfectly, since different manufacturers will use different shades of purple and call them by an assortment of color names. Purple paint might be a bit too much. However, a few purple kitchen appliances should be a joy for creative people. Purple kitchen curtains would be attractive, too. At the very least, purple is one of the most unusual kitchen colors. From ancient times, the traditional color of royalty has been the color purple. Created by mixing strong warm and strong cool colors, purple has properties of both warm and cool colors. The reason only royalty wore purple is that the color purple was a very expensive dye to create. Only the very wealthy could afford purple clothes. In fact, merchants who made and sold purple dye were well respected, and usually quite wealthy. This mixer comes with a 5 quart stainless steel bowl that locks into place so that the mixer action does not sling your batter across the room. The tilt-head design permits easy access, so that you can easily change the beater or add ingredients. Whether you are whipping cream or mixing the stiffest cookie or bread dough, this mixer can do it. It comes with three beaters, the flat beater, the coated dough hook, and the 6-wire ship. As you can see below, there is a wide range of purple colors in kitchen ware. Would you want purple in your kitchen?